If you’re going to teach something, you should understand it yourself first—at least to the level where you can be sure that what you’re teaching is correct. On that count alone, English Explained 8: The Adverbs doesn’t just fail, it fails with an adverb: “miserably”. Worse still, it’s part of a series of 14. I shudder to imagine the mangled concept of grammar that any student completing the series would have. The Be/Have/(Do) Grammar Matrix™ is supposed to be the overarching concept for the series. It’s a very rudimentary concept. Guess what? It’s a very rudimentary matrix. Essentially, it’s just three lists—dividing verbs into “be”, “have” and, er, everything else. But I suppose the Be/Have/(Do) Lists of Verbs™ would have sounded a bit less impressive. Although the concept’s important, it isn’t enough in itself to explain the whole language or indeed how to think in English. To suggest that it is, as Lipes does, is absurd. It certainly doesn’t add anything to the explanation of adverbs that Lipes is supposedly giving us in this book. Nor is it common to all languages, despite Lipes’s confident assertion. Some languages don’t bother with the verb “be” where English would insist on it. (Russian has no verb “be” in the present tense; Thai doesn’t use a verb in constructions like “I am tired”.) Others don’t have a verb “have”, but talk round it by constructions like “At me there is…” (eg Russian—again—and Gaelic). This gives the impression that Lipes is trying to shoehorn every language into a construction that exists in English, just because it’s a structure that he’s familiar with. There are several attempts to blind with science. Relatively mundane and common grammatical concepts are presented as if they mark out English as somehow unique. The Subject – Verb – Object structure is not unique to English, by a long way—it’s a feature shared with most European languages and several non-European ones (eg Thai). Nor is it intrinsically simpler than, say, Verb – Subject – Object (as in Gaelic) or Subject – Object – Verb (like Bengali). It’s just one way of doing things. The author doesn’t understand the difference between phrases and clauses. A clause has to have a predicate; in other words, it has to have a main verb somewhere. In the sentence “The books I wrote are going to help you learn easily”, “The books I wrote” is not a clause, because it has no main verb. “Wrote” isn’t a main verb, it’s part of a relative clause (it’s a contraction of “which I wrote”). The only main verb in the sentence is the auxiliary “are” (or, at a slight stretch, “are” together with the present participle “going”). In any case, the book’s supposed to be about adverbs. Yet it doesn’t start discussing them until about a quarter of the way through. I wonder whether the rest of the series have the same 25 per cent of duplicate content at the front? …technically, describes the action, and, difficult, describes the Understood Object (a task). This is just plain wrong. “Technically” is indeed an adverb, but it qualifies “difficult” (the description of the “Understood Object”), not “was” (the action). And what he describes as the Understood Object (“Putting the table together”) is simply the subject; the sentence contains no object. 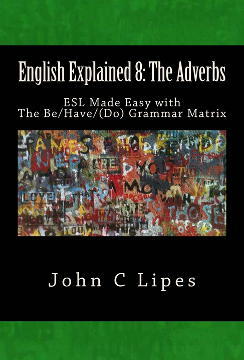 Just like Adjectives describe Nouns, Adverbs describe Verbs and they are found under all three Columns in the Be/Have/(Do) Grammar Matrix. Adverbs can also qualify adjectives (as in “This book is woefully inaccurate”) and conjunctions (as in “Just because someone’s studied a little grammar, it doesn’t mean they’ve understood it”). There’s a table explaining the nuances of adverbs of frequency. This is a good idea, but unfortunately Lipes makes a hash of it. As presented, his table suggests that “periodically” is less frequent than “rarely” or “seldom”, and that “often” is more frequent than “usually” or “normally”. Most worryingly, Lipes doesn’t always understand the distinctions between an adverb on one hand and an adjective, a conjunction or a preposition on the other. “Beyond” can indeed be an adverb—as in “He looked over the fence at the fields beyond” —but in the case that he cites, “Why people are so selfish is beyond me,” it’s a preposition governing the pronoun “me”. It’s perhaps because of this apparent failure to understand the nature and function of an adverb that Lipes has written a whole section, “Adverbs of Purpose”, which doesn’t give a single example of an adverb but instead enumerates several conjunctions (“as”, “because”, “so”), prepositions (“for”) and prepositional phrases (“in order to”, “to be”, “to have”, “to (do)”). Kay normally includes an affiliate link to books she reviews for this blog, on the basis of caveat emptor. But this book is wrong in too many places for students to rely on it as a study aid, and the list of flaws above isn’t even exhaustive. If you’re looking for help with your English grammar, look elsewhere.